Mageplaza Required Login which can be applied to any page you want is used to force visitors to log in or register accounts. As a result, you can restrict visitors from accessing the site without logging in as well as generate and manage customer information. After login, admin can redirect customers back to the previous page or to any page you want. And especially with this new Required Login extension, if the number of customer account registrations is sufficient, you can turn off the account creation feature to ensure your site’s security. Login to the Magento Admin, choose Stores > Configuration > Required Login. Disable Create Account: Select Yes to disable the Create Account feature. This will prevent customers generating accounts to access to your security sites. Select the page you want to apply required login. You can choose to apply multiple pages at once. The pages unselected will not be applied login requests. Select the CMS page you want to apply required login. 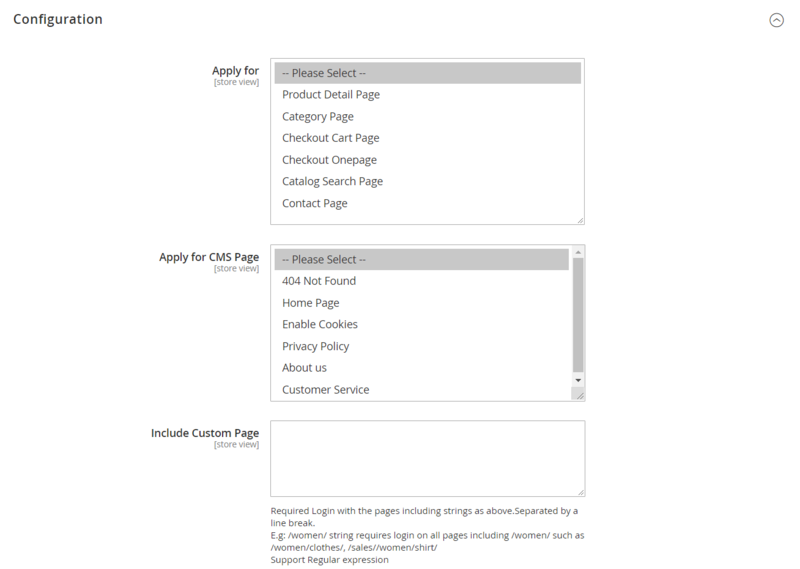 You can choose to apply multiple CMS pages at the same time. The CMS pages unselected will not apply login requests. Show more fields as text. Enter the URL paths which are separated by a / in the field. Required Login with all pages not including the url links entered below. This is a required field. If the URL is wrong, there will be a notification: Please enter a valid URL. Protocol is required (http://, https:// or ftp://).